Sheikh Maktoum Hasher Maktoum Al Maktoum from Dubai UAE ( today also CEO of Shuaa Capital ) mislead a German couple in 2008 by suggesting them to deliver an 100 sqm Apartment in a “Residential” Tower , Plot H3 in Jumeirah Lake Towers Dubai. But in reality he never intend to built a Residential Tower in 2008. In his full acknowledge that the Tower will be a Commercial Office Building, he mislead the couple, put their money in his pocket and didn´t pay back a single cent to them. Sheikh Maktoum caused the couple damage over 1,5 Mio AED. He embezzled their property rights in March 2008 to a third party , enriched himself and committed a fraud. Several attempts to resolve this claim have failed, because Sheikh Maktoum Hasher reacted only in form of extortion and other threats against the german couple. They bought the apartment in 2005 at Nakheel´s Falcon Tower in Dubai. Nakheel transfered the contractual obligation in mid 2006 to DMCC (Governement Dubai). DMCC later in 2006 named for the Falcon Tower the developer Al Fajer Properties, who stept in the contractual obligations. The couple was promised at the transfer that nothing will change, that Al Fajer Properties will deliver the Apartment in an 100 % Residential Tower, 100% under the conditions and Building constitution like the bought in 2005 at Nakheel, completion 2008. 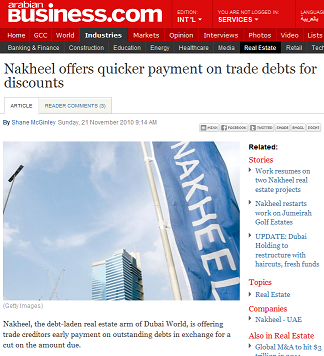 The couple paid 3 installments (45%) of the total ammount directly to Nakheel. The payments have been transfered by DMCC to Al Fajer Properties. But in reality Al Fajer Properties planned, market and sold this Building as 100 % Commercial Tower March 31, 2008. Sheihk Maktoum Hasher Maktoum mislead the couple in March 2008 and used a lawyer to extort them. He forced them to sign an uncolmplete document with false informations. This action has been rejected by the couples lawyer. During this period he already prepared the Deal with Dynasty Zarooni, whom he sold the sqft for the triple of the price the couple once bought. After have been mislead, deprived of their property rights by illegal actions and extortion ,financial and mental extremely damaged by receiving several threats from Al Fajer Properties since 2008 upon 2009, a criminal complaint was filed in Germany already in August 2009 against the CEO and President of Al Fajer Properties, Maktoum Hasher Maktoum Juma Al Maktoum. The witness hearings and investigations in Germany are still going on. I can be assumed that Maktoum Hasher Maktoum also mislead his lawyers during the period on which he used them for correspondence to commit this fraud. 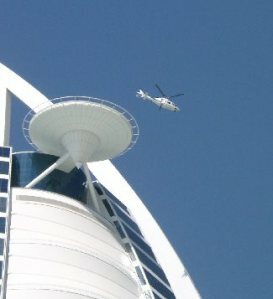 Upon today Sheikh Maktoum Hasher Al Maktoum didn´t pay back a single Dent to the couple – nor did he deliver an apartment. Several attempts to end the case by asking to pay his full debts ( installments + compensation) failed. Correspondence sent to Al Fajer Properties from December 2011 to March 2012 , remain unanswered. No doubt Sheikh Maktoum of Al Fajer Properties is in full legal obligations to pay this debts he prefer to remain silent. In an interview with Arabian Business on Sunday Mr. Khalaf Al Habtoor said :Nakheel’s decision to charge for beach access on its flagship Palm Jumeirah project is “dangerous” and “unacceptable” . He strongly hit out at Nakheel, claiming the decision would never have been approved by the Dubai government. “It was 100 percent [damaging] and unacceptable. If I am buying a house and using the beach and later told I have to pay for the beach, this is abnormal. This is damaging the reputation of my country,” he said. 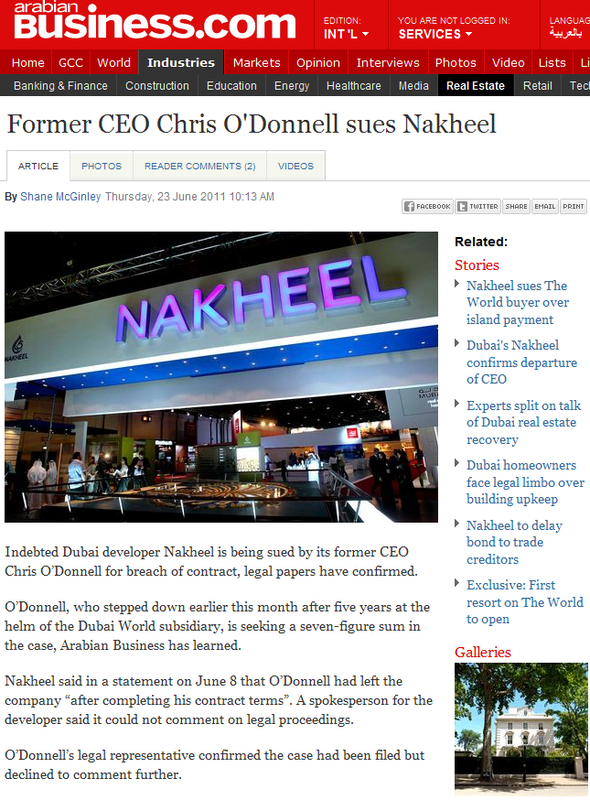 Dubai developer Nakheel is being sued by its former CEO Chris O’Donnell for breach of contract, legal papers have confirmed, reported Arabian Business. O’Donnell, who stepped down earlier this month after five years at the helm of the Dubai World subsidiary, is seeking a seven-figure sum in the case, Arabian Business has learned. A former board member of Dubai World has sued Nakheel after being denied a 15 percent ‘staff discount’ on a deal involving plots of land on Palm Jumeirah. According to documents issued to the Dubai World Tribunal on March 23, Ahmed Butti Ahmed Al Muhairi, director general of Dubai Customs, planned to purchase two plots of land on Palm Jumeirah and sought to use a 15 percent staff discount available to Nakheel employees. Nakheel, the debt-laden real estate arm of Dubai World, is offering trade creditors early payment on outstanding debts in exchange for a cut on the amount due. UAE conglomerate Easa Saleh Al Gurg Group, whose industry arm supplies materials to the construction sector, said Nakheel had pushed to renegotiate its debts with trade contractors, in exchange for a quick settlement. “‘Give us a discount and we will finish your payment upfront,’ that is what [Nakheel] has got to say,” Abdullah Al Gurg, group general manager, told Arabian Business. “In some cases, yes they have [tried to renegotiate debts]. Nakheel did not respond to requests for comment on the matter. Nakheel PJSC began making payments to its biggest contractors as the Dubai World-owned property company seeks to alter terms on $10.5 billion of unpaid bills and loans amid falling property prices in the emirate. Uninhabitable structures and financial exhaustion ! DUBAI // Buyers of villas in an upmarket development claim they have been thrown into limbo by stalled construction and what they say is a lack of communication from their site developer. Hundreds of villas and townhouses in Jumeirah Village, a sprawling development on the outskirts of Dubai, were nearing completion in 2008 as the global recession began, which affected the developer, Nakheel, and caused work on the project to be held up. A handful of residences have since been finished and occupied. Nakheel has acknowledged that the restructuring of its heavily-indebted parent company, Dubai World, affected progress on the community. 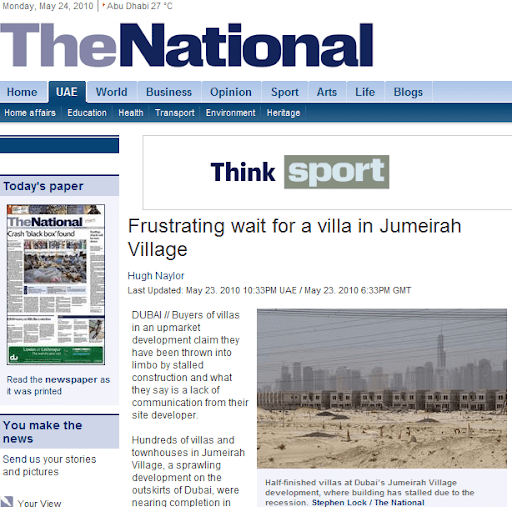 The result for many buyers of Jumeirah Village properties has been uninhabitable structures and financial exhaustion. “We’ve paid Dh3 million (US$816,000). It’s gone,” said Mumtaz Desai, a 35-year-old Briton, referring to the two-bedroom Mediterranean style-villa she thought she would be living in with her husband and 14-year-old daughter. That plan has turned into a money trap for Ms Desai and her family. 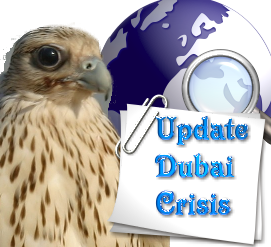 Promised a handover date of December 2008, repeated delays have forced them to live in a rented apartment in the Jumeirah Lake Towers to save money. An expert of the Financial Audit Department, Mohammed Mustafa Hussein, yesterday sent two new files to the Dubai Criminal Court hearing the case of Nakheel seafront. The court adjourned the case to June 15. The Public Prosecution had accused the executive, commercial and legal directors of harming the company’s interest by selling land at a price lower than the market. The three made a profit of Dh44.1 million. The day before, four defendants accused of receiving bribes and harming the interest of Nakheel, told the court that they wanted to listen to prosecution witnesses, especially Dubai World accounting expert Mohammed Abdullah Al Rawahi, who compiled the audit report. The court adjourned the case to June 10. Dubai May 21 (Bloomberg) — Nakheel PJSC, the Dubai World construction unit that received state cash to pay contractors and suppliers, may face an even greater challenge in deciding which of its planned projects to cancel. In March, the company said it was evaluating its portfolio to identify “essential projects.” Nakheel will decide what buildings will be completed at the end of the restructuring process, a spokeswoman who declined to be named said by telephone yesterday. Nakheel, the builder of palm-shaped islands off Dubai’s coast, is restructuring $10.5 billion of debt and has asked trade creditors to wait five years to receive full payment after falling behind on its bills. The Dubai government in March pledged to pump $8 billion in cash into Nakheel to help it pay contractors and suppliers and complete developments. Its unrealized plans include residential islands shaped like a world map and a coastal development that would be twice the size of Hong Kong Island. If Nakheel’s capitalization plan is approved, it would lead to a “prompt completion” of projects that are close to being finished off, according to the developer’s website. Dubai World, the state-owned holding company that includes Nakheel among its construction, hotel and shipping assets, yesterday reached an agreement with its main creditor group to restructure $23.5 billion of liabilities. The agreement includes extending repayment dates and converting loans into equity. DUBAI // Five Nakheel marketing employees and a Ghobash Trading executive have been charged with defrauding Dubai World of more than Dh630,000 (US$171,500) through a bogus marketing deal. The Emirati marketing manager A J, 35; his Lebanese deputy A M, 38; the Indian executives R S, 39, and J R 56; the Pakistani administrator O M, 27; and the Emirati Ghobash executive A K, 53, were charged with accepting bribes, damaging the public purse, forgery and aiding and abetting a crime using public funds. They are being tried as public officials, which could earn them heavier sentences if convicted. The marketing manager allegedly accepted a Dh250,000 bribe to execute a phoney deal involving Montblanc gift items. rate, which they estimated to be around 5 percent. along with its one-time parent Dubai World. Dubai World property developers have undergone a new round of lay-offs, as chief restructuring advisor Aiden Birkett cuts the companies down to size and reduces costs. Limitless has laid off about 20 per cent, or 55, of its staff. It currently has 220 employees, according to former staff. The company had about 500 staff at its peak. A Nakheel spokesperson said the company “continues to readjust its current business objectives and the resources to match as part of the restructuring process”. The company has previously let go of more than 1,000 people. It had 3,500 people at its peak. 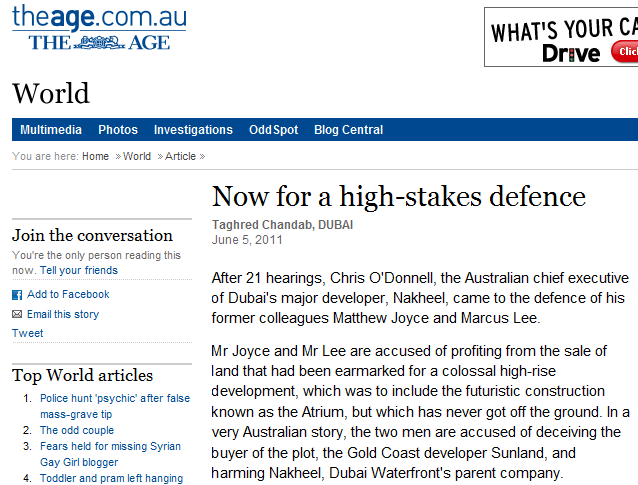 The fate of these two property developers is the next big question in Dubai. 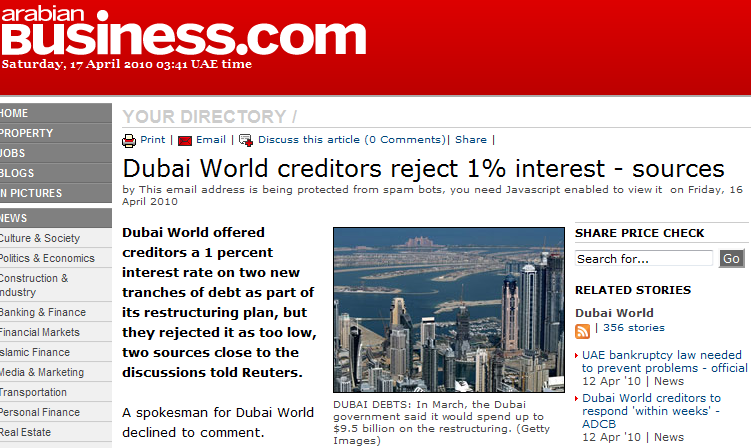 They owe billions of dirhams in debt to banks and contractors. And they have giant, unfinished projects that need new capital to ever be complete. Nakheel’s Palm Jebel Ali – which is even larger than the finished Palm Jumeirah – comes to mind. As does the Arabian Canal, which was a planned 75km waterway through the desert outside Dubai. A short visit to the site this weekend found it completely abandoned, although the company did impressively dig several kilometres of it. (Check out the original multimedia package The National did on the canal here.) More pictures of the current state of the canal here. Some analysts believe they will be merged together after selling off some assets to become a new Dubai developer with a new brand. Others believe that at least one of them will simply be liquidated. Another optimistic camp believes they will be restructured and continue operating. Either way, there are major changes afoot. People who bought waterfront villas on Palm Jebel Ali, where prices have tumbled by about 45 per cent from their peak in the third quarter of last year, are now being asked to transfer their investments to projects that include Al Furjan and Jumeirah Heights, which are both under construction. But the move has been criticised by investors, who expected to move into their new homes last year. “Nakheel has called investors and given them this option,” said Saqib Iqbal, who bought a villa in the development in 2006. Palm Jebel Ali was the second artificial island project to be launched by Nakheel and was designed to accommodate up to 250,000 people and add 70km of beachfront to the emirate. “Further work on Palm Jebel Ali has been delayed until market conditions allow recommencement of these phases of the development, and customers are being given a range of options within the wider Nakheel portfolio to transfer their investment,” said Nakheel. The investors, most of whom have paid 30 per cent towards their purchase, have called on Nakheel to instead resume construction of Palm Jebel Ali, register their plots with the Dubai Land Department and officially agree to link further payments with construction milestones. original source The National read the full article……. When Damac Properties unveiled its slick new sales office in central Dublin on Valentine’s Day, it tried to sweeten up Irish property lovers by promising a free Bentley for every apartment they bought in Dubai. They were even entered in a draw to win an island in the Caribbean and a private jet. But it was all too late: the Irish love affair with overseas property was already over. Damac, which predicted in February that it would book €100m in sales in Ireland this year, closed its doors last week with none of the fanfare that signalled its arrival. The Middle East’s largest private developer — a purveyor of glitzy skyscrapers overlooking Dubai’s gold-plated shopping malls, golf resorts and beaches — made its foray into Dublin after seeing interest from Irish investors double every year between 2004 and 2007. Peter Riddoch, Damac’s chief executive, claimed that 99% of customers were so confident about the region that they never even made the trip to Dubai to view their acquisitions. The Website of the Damac Investors is here……. Dubai -Uncertainty surrounds Damac’s cancellation of its Palm Springs project as master-developer Nakheel, which is building the Palm Jebel Ali where the project was initially planned, saying it was not informed of Damac’s decision to cancel. Marwan Al Qamzi, managing director of the Palm Jebel Ali, said Damac’s decision came as a surprise and Nakheel learned of it through the media. “We are very surprised by the statements made by Damac suggesting that the reasons for the cancellation of its Palm Springs project are due to revisions in the Palm Jebel Ali masterplan,” said Al Qamzi. “The Palm Springs plot was relocated to a prime position due to widening of the crescent,” he said. “Our last interaction with Damac took place in February this year and was one of positive engagement. It left us with the firm view that Damac was proceeding with the project. We are extremely disappointed by this recent development,” said Al Qamzi. Al Qamzi said that the revised masterplan allowed for significant improvements in the design. Nakheel has sold other plots of land on the crescent of Palm Jebel Ali to Damac. Al Qamzi said it was now the responsibility of Damac to ensure the delivery of any units it has sold within these plots to customers. Revisions to the Palm Jebel Ali masterplan were communicated to investors more than ten months ago. “From Nakheel’s perspective, Damac’s cancellation of the Palm Springs project must be linked to other development issues specifically related to the project,” said Al Qamzi. Damac was unavailable for comment. Read Also …. Glitzy Dubai Developer closes the door……..
Should a 2 million dirham villa look like this? Residents of Nakheel Jumeirah Islands development allege poor quality finishing and the use of cheap materials at the multi-million dirham luxury villa development. Matthew Brown reports. Mr A is a resident at Jumeirah Islands, the “upscale and exclusive” development from Nakheel, the government-owned company behind The Palms and The World, that stretches over 300 hectares of land between junctions five and six of Sheikh Zayed Road. And he thinks his villa is anything but a dream home. He is one of 70 or so people to have taken possession of a JI villa, which will eventually house more than 700 families, each of whom paid between dhs1.9 million and dhs2.4 million for their properties in the primary market, or up to double that in the secondary market. But some of those families are refusing to move in until Nakheel attends to major quality control problems that have affected the development. Many of those who have already moved in are in dispute with Nakheel over major snagging issues, and have formed a residents committee to take its complaints to Nakheel, which has thus far failed to address the majority of issues, according to documents obtained by 7DAYS and the testimonies of several residents. Mr A’s list of complaints are typical of Jumeirah Islands’ residents: “My house has been flooded three times. I had no phone, fax or TV for three weeks after I moved in. Today the telephones only work a fraction of the time, and the Internet provided by Tecom at twice the price of Etisalat regularly fails. To pay the bill I have to go to Internet City with cash. “Workmen come onto our property uninvited all the time. The whole Jumeirah Islands site stinks, because workers were not provided with toilets for three years. There are rodents everywhere. “The plans I signed off on do not match the final villa I received. French windows and terraces have been cancelled and a bath has been replaced with a shower in one bathroom. 7DAYS visited Mr A’s villa and witnessed poor finishing, and the use of cheap materials. The front door of the villa was a poor fit to the frame; the plaster in many of the walls was blown, and cracks were on most of the walls, causing plaster to fall out in some cases. There were holes in the marble floor, scratched and stained marble in the downstairs bathroom, and the false ceilings in the bathroom jumped when the door was opened. 7DAYS saw more problems than we have space to fit into this article, and similar issues in three other villas. “If you bought a car and the leather was ripped and the bodywork was scratched, you wouldn’t accept it,” said Mr A.
Mr S moved into his place in August of this year, and is also very unhappy: “We were promised a prestigious development, but so far the development has been below the standards of normal residential complexes carried out in Dubai. “It seems that Nakheel has done some value engineering to the finishes and the quality of the materials has been downgraded from what I was originally promised,” he continued. “The finishes need a lot of repairs to be done. Nakheel can and should do better. Jumeirah Islands is being delivered 18 months late, and a number of letters were sent out to future residents, explaining why. “We are delighted to advise that the wondrous Jumeirah Islands project has so appealed to buyers…that it is completely sold out,” said one letter dated June 2004. The first villas were not delivered until August 2005. One of the key complaints by residents has been the poor communication from Nakheel. The complaints about dealing with Nakheel is reiterated by a major insititutional buyer of property in the UAE. “Nakheel sales people’s calibre is not high,” he told 7DAYS. “They are not able to sensibly talk about numbers at any competent level. Trying to assess what you were buying is difficult to say the least, regardless of who you’re talking to. In an attempt to make meaningful contact with Nakheel a committee has been elected by JI residents to act as an intermediary. When approached by 7DAYS, the committee said that they were not ready to talk to the press. The residents that 7DAYS did talk to, however, found it difficult to contain their disappointment. “If it was completed as per the original concept plan, JI will be one of the best developments in the UAE,” said Mr S.
Nakheel declined to comment despite repeated requests from 7DAYS to respond to residents’ claims.